When I had just begun fiddling at the age of 10, I encountered the normal struggles that any new musician must face. I grew up in this organization and there are several people who come and go throughout your growth and participation, but some people are always there-never faltering or wavering. E.J. Hopkins was one of these people. Of course we all know that it was because he liked to fiddle. Maybe it was because his heart was with TOTFA as well, just like mine, and many others. He helped found our organization back in 1973 and he has stayed with us ever since. In nearly every contest I have attended I have a memory of E.J. and his wife, Vi, sitting in the background or in the audience listening to the fiddle music. E.J. was a tall man, and his height could make him seem intimidating, but I don’t recall him ever saying anything unkind to me. I can remember E.J. always being a gentleman who would politely give me feedback on my tunes. All of which was so valuable to me. He taught me variations at contests here and there, and I can remember one year at Weiser when he tried to teach me a rag. He was a kind and patient man and loved fiddling more than most. For those of you who know the Hopkins Family, please lift them up during this time of sorrow as they deal with the loss of a great man. 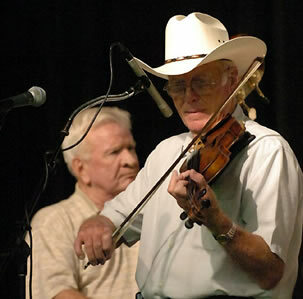 I have included a biography from his induction into the Texas Fiddlers Frolics Hall of Fame in 1991. He leaves behind not only a fiddling legacy but a long line of musical members and family. Services were held Monday, April 16th, in Huntsville, Texas. We have kicked off April with a great contest in Llano. There was a fantastic turn out and great participation. Thank you to John Caballero and the City of Llano for putting on a wonderful contest yet again. I have included the results of the fiddle fest here. I am sure we will seeing many familiar faces again in a few weeks at the Texas State Championship Fiddler’s Frolics. For contest details and division information, please go to www.fiddlersfrolics.com. May brings a couple of staples to us for Texas Fiddling. The 50th Anniversary contest in Groesbeck will be on May 19th, and the Athens Old Settler Reunion fiddlers contest is May 25th and 26th. As we get into June, we have more contests to follow so please keep watch on the Facebook page for the most current information. TOTFA is looking for a new WebMaster to help us with our website www.totfa.org. If you are interested or have any leads, please reach out to myself or any other directors. Happy Spring and Happy Fiddling!!! Disc 2: The Devil's Box Bonus Disc features 42 complete fiddle tunes played by contestants from around the country as well as performances by Larry Franklin, Texas Shorty, and many, many more. Disc 3 The Lost Benny Thomasson Tapes: This disc is a wonderful hour-long interview with the master himself, Benny Thomasson. Benny tells the story of Texas-style as only he knows it and plays 19 tunes like only he can. This interview from 1976 has been cleaned up and remastered and is the ideal tutorial for any fiddler who wants to hear the tunes exactly as Benny played them and learn some fascinating fiddle history along the way. To buy the 3-disc set, click the "Buy Now" button below. You may pay with a credit card or a PayPal account. Thank you for your support! And spread the word about The Devil's Box - the happy documentary! Of course, sometimes the old ways are best, and we can handle that too. Send your check to the address listed below.